Khloe Kardashian joined sisters Kendall and Kylie Jenner on the red carpet for the 2014 American Music Awards held at the Nokia Theatre L.A. Live on Sunday (November 23) in Los Angeles, California. Going short, instead of opting for a thigh-high slit gown, the reality TV star wore a Versus Versace Spring 2015 LBD designed with plenty of seductive appeal. The asymmetrical hemline and gold lion head-detailed plastic discs, which she complemented with a selection of gold jewels, help elevate this frock from simple LBD to new heights. Was she the best dressed Kardashian-Jenner? 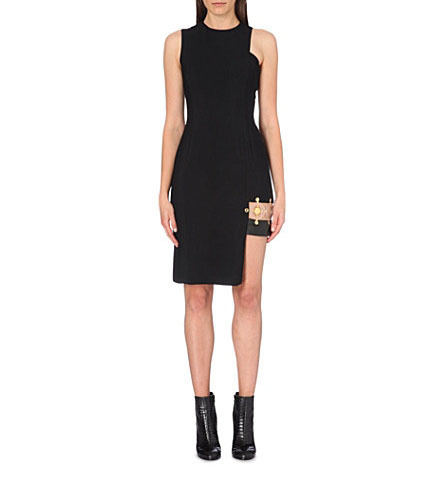 You can buy Khloe’s Versus Versace Abito Bonna Tessuto Crepe Dress from Selfridges.